Poles migrating to Detroit began to settle on the west side late in the 1870s. Westside Poles who wished to attend a Roman Catholic Church had to travel to St. Albertus on the east side until Bishop Casper Borgess established a parish for Poles in 1882, St. Casimir. That church was located at 23rd and Myrtle and continued to serve members until its close in 1989. At least four other Polish parishes were established nearby on Detroit’s west side: St. Francis of Assisi (1889), St. Hedwig (1903), Assumption of the Blessed Virgin Mary (1911) and Our Lady Queen of Angels (1915). Only three of those parishes—St. Francis of Assisi, Our Lady Queen of Angels and St. Hedwig—survived into the 21st century. In most of the large Polonias that emerged in the United States, there were not only several massive Gothic-style Catholic churches, but also a social and meeting hall called Dom Polski (Polish home). The picture you see is the Dom Polski Hall that served Detroit’s west side Poles. 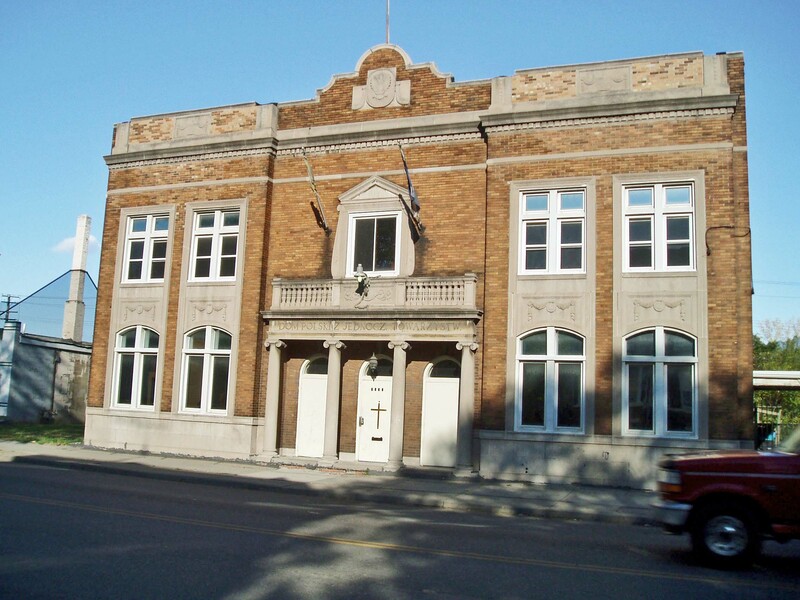 Plans for this hall were developed in 1913 by two Polish social organizations, Lodge 649 of the St. Isadore Society and Lodge 1009 of the St. Cecila Society. Land for the building was secured and, on July 5, 1917, the first cornerstone was laid toward the rear of the structure. However, financial problems developed and the building was not completed and dedicated until September 15, 1925. You notice that four Ionic columns support a portico bearing the inscription: Dom Polski Z Jednoceae Towarzstw, that is, Dom Polski United Societies. Joseph Julius Gwizdowski was selected as the architect for this building. Born in 1880 in Galicia, he graduated from a Polish technical institute and migrated to Chicago four years later where he enrolled in Loyola University. Subsequently he started his career as an architect by designing residential structures for the north side of Chicago. Throughout his career, most of his designs were in the Classical Revival style. Gwizdowski designed the Georgian Revival Hamtramck Municipal Hospital that opened in 1927; a building that is listed on the Michigan Register of Historic Places and presently serves as that city’s municipal hall. He also designed a school for St. Cunegunda’s Parish in Detroit where Masses are now said in both Polish and Spanish, a police station located on Davison and the building at Joseph Campau and Norwalk in Hamtramck that is the home of the Polish Art Center. Perhaps, Gwizdowski’s major commission was the main building for Alliance College. The Polish National Alliance was founded in 1880 and continues to exist. It began as a collective organization of Polish fraternal clubs in the United States. Since 1885, it has also been a mutual benefit insurance organization. In 1912, the Polish National Alliance established a Polish language college, Alliance College, in Cambridge Springs, Pennsylvania. When funds became available to construct a major building worthy of that institution in 1930, Joseph Gwizdowsk was chosen as the architect. He designed a large two-story red brick building in the Classic Revival style with four Ionic Columns supporting a portico that dominates the front. There have been quite a few attempts to establish foreign language colleges in the United States, but few have been successful. Their popularity was never great, so it is no surprised that some of them disappeared after World War II. Some switched to English as the language of instruction, while other went out of business. Alliance College survived until 1987. The magnificent collegiate building that Gwizdowski designed was sold to the State of Pennsylvania and is now a minimum security prison for women who completed most of their penitentiary time and are awaiting release. The Dom Polski Hall you see pictured on this page is currently home to the West Side Detroit Polish-American Historical Society, an organization founded in 2006. National Register of Historic Places: I believe that the West Side Detroit Polish-American Historical Society nominated this building for listing on the National Registry of Historic Places. I think that the State Historical Commission endorsed this nomination in September, 2007.